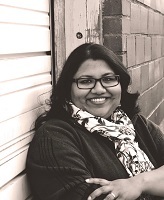 Sayantani Dasgupta has taught creative writing in the United States, India, Italy, and Mexico. She is an essayist, a short story writer, and the author of Fire Girl: Essays On India, America, & The In-Between—a finalist for the 2016 Foreword Indies Award for Essays—and the chapbook The House Of Nails: Memories Of A New Delhi Childhood. Born in Calcutta and raised in New Delhi, Sayantani received a BA in History from St. Stephen's College, Delhi, an MA in Medieval History from Jawaharlal Nehru University, New Delhi, and an MFA in Creative Writing from the University of Idaho. Sayantani's essays have won a 2010 Pushcart Prize Special Mention, and Dukool Magazine's 2016 Prize for Creative Nonfiction. Her essay "Oscillation" was the finalist for Phoebe Magazine's 2014 Creative Nonfiction Contest judged by Cheryl Strayed. Other works have appeared in The Rumpus, Scroll, The Hindu, Hunger Mountain, and other magazines and journals. Honors include a Centrum Fellowship, an Artsmith Scholarship, and a Study Abroad Research Grant.